I’ve been working on establishing a better archive of stock footage for my projects, so tonight I took my camera out into one of the fields to film the sunset. It’s not the first, nor the last time, but I’m trying to get a variety of sunsets, mostly for the purposes of time-lapsing them as part of any video that might suit such a thing. 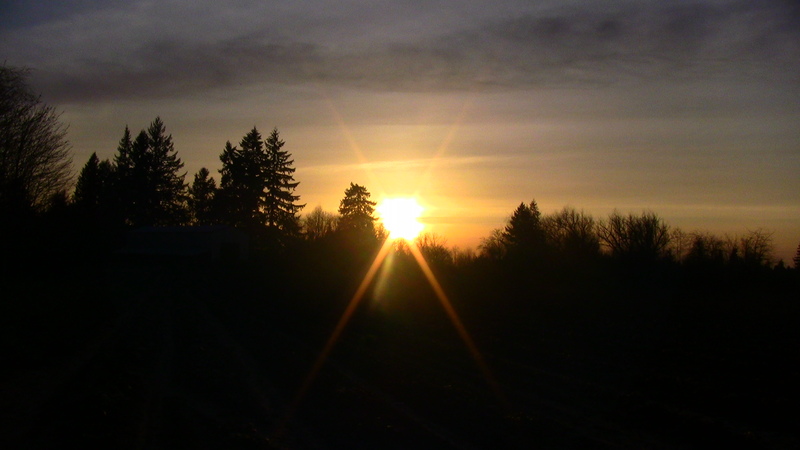 Above is a still I took of the sunset I filmed tonight. This is a view I grew up with, watching the sun set over those trees. You can’t really see it due to the lower exposure I chose to establish for tonight’s shoot, but there’s also a barn on the left side of the frame. One thing about spending time back on the farm is getting to relive these little moments. Sometimes, it feels confining, like I’ve stepped too far into the past and I can’t get out again. But some things are relaxing, comfortable, and give me hope. Things like playing with the dogs, hiking in the forest, spending time with my family, and even getting into a conversation about moral relativism with my little sister while tucking her in for bed. Things like the fresher air and the lack of constant sirens. Things like sunrises over Mt. Hood, and sunsets over the barn. These are the little things that help me rebuild myself.